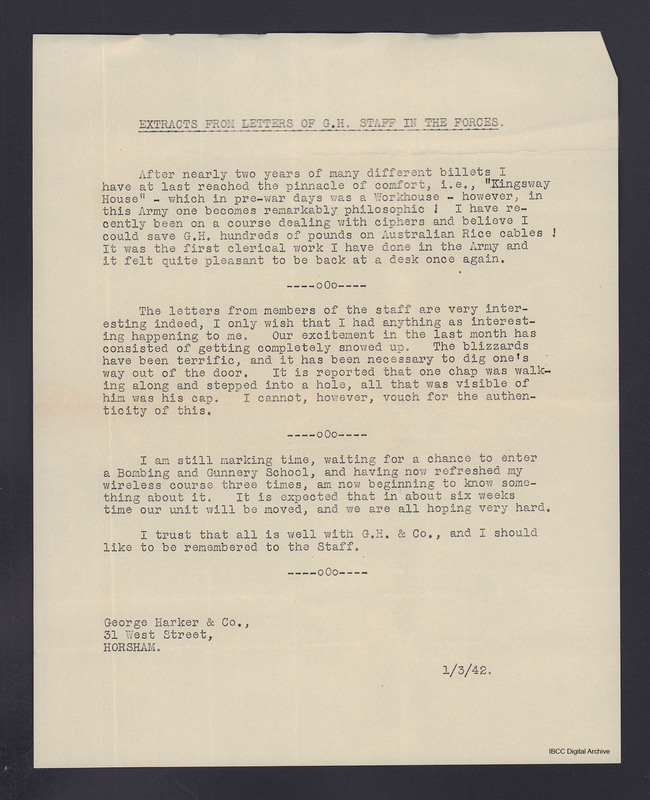 Three extracts of letters of staff of George Harker and Company Limited serving in the forces. 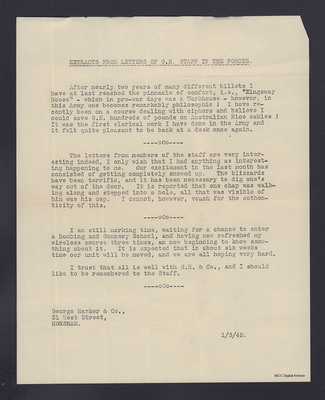 The first relates to clerical duties in the army, the second complains of nothing happening apart from being snowed in and the third waiting to start bombing and gunnery school. After nearly two years of many different billets I have at last reached the pinnacle of comfort, i.e. “Kingsway House” – which in pre-war days was a Workhouse – however, in this Army one becomes remarkably philosophic! I have recently been on a course dealing with ciphers and believe I could save G.H. hundreds of pounds on Australian Rice cables! It was the first clerical work I have done in the Army and it felt quite pleasant to be back at a desk once again. The letters from members of the staff are very interesting indeed, I only wish that I had anything as interesting happening to me. Our excitement in the last month has consisted of getting completely snowed up. The blizzards have been terrific, and it has been necessary to dig one’s way out of the door. It is reported that one chap was walking along and stepped into a hole, all that was visible of him was his cap. I cannot, however, vouch for the authenticity of this. I am still marking time, waiting for the chance to enter a Bombing and Gunnery School, and having now refreshed my wireless course three times, am now beginning to know something about it. It is expected that in about six weeks time our unit will be moved, and we are all hoping very hard. I trust that all is well with G.H. & Co, and I should like to be remembered to the staff. G Harker and Company, “Extracts from Letters of G.H. staff in the forces,” IBCC Digital Archive, accessed April 23, 2019, https://ibccdigitalarchive.lincoln.ac.uk/omeka/collections/document/11274.